I started using this spray for about 4 months now, i can tell that there is new hairs start to grow up, my hair start to look thicker and healthier, the plan is to use it for up to 6 months then I may post some photos then. The Regenepure Precision Minoxidil Hair Loss Treatment Spray has forever changed the way men fight back against male pattern baldness. Use it twice a day and experience exceptional hair regrowth for yourself. Minoxidil is thought to induce an early anagen phase when it’s applied to your scalp, meaning it can cause hair follicles to go through the rest of the growth process prematurely before starting to grow again. Since minoxidil can start a fresh anagen phase for some of your hair follicles, it usually takes several months before you’ll notice any effects on hair growth. 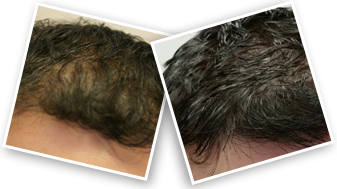 Most studies indicate that the results from minoxidil usually start to show after six months, with few or no visible results in the first three months of use.In one clinical study, 26% of men reported moderate to dense hair regrowth, after using minoxidil topical treatment for 4 months. 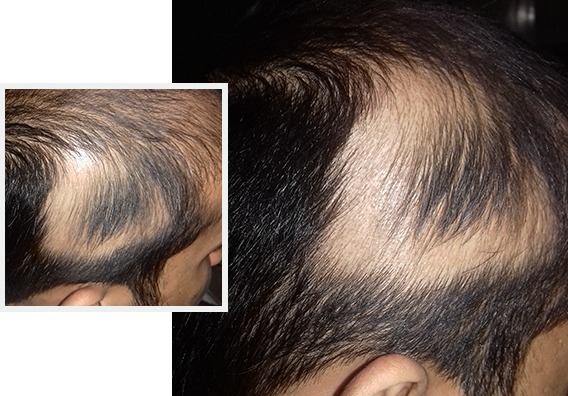 This shows that minoxidil does work if it’s used consistently. What makes our minoxidil spray superior? 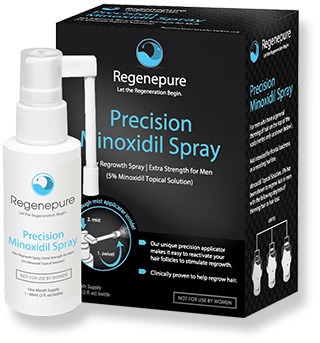 Regenepure Precision 5% Minoxidil Spray is specially designed for men. The fine mist applicator ensures a clean and targeted application of minoxidil without any cleanup. 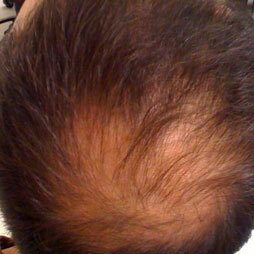 Male pattern hair loss (MPHL), also known as androgenetic alopecia (AGA), affects the majority of men by the age of 50. In fact, around one-third of men are already suffering from AGA by the age of 30. For those who start losing their hair during their teenage years or 20s, this problem can be especially devastating. 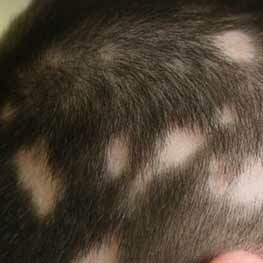 The cause behind AGA is due to the adverse impact of androgens upon human hair follicles. In particular, the male hormone dihydrotestosterone (DHT) attacks scalp hair follicles in those with the genetic susceptibility. Over time, DHT gradually shrinks hair follicles to the point of no return when they become fine miniaturized vellus hairs that are invisible to the naked eye. Men with male pattern baldness have hair follicles that are hypersensitive to the effects of a hormone called dihydrotestosterone(DHT). DHT is a derivative of testosterone, with the former much more potent than the latter. Ironically, while DHT hurts scalp hair growth, it benefits body hair growth. In early childhood and into puberty, DHT is crucial for male genitalia differentiation and subsequent development. DHT also ensures growth of body hair in men. However, in later years, DHT causes prostate gland enlargement and male pattern hair loss. Most research seems to indicate that reducing DHT levels in later years does not seem to cause any major health problems in men. Male pattern hair loss is believed to be caused by a combination of genetics and the male hormone dihydrotestosterone (DHT). 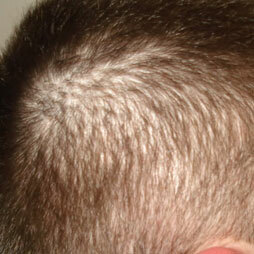 Hair loss primarily affects the top and front of the scalp. 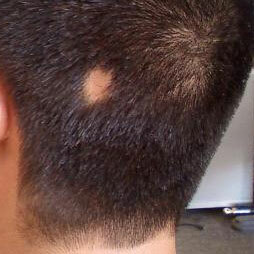 In males, the hair loss often presents as a receding hairline. Medical conditions that can cause hair loss include thyroid disease, alopecia areata (an autoimmune disease that attacks hair follicles) and scalp infections like ringworm. Diseases that cause scarring, such as lichen planus and some types of lupus, can result in permanent hair loss because of the scarring. Traction alopecia is most commonly found in people with ponytails or cornrows who pull on their hair with excessive force. In addition, rigorous brushing, heat styling and rough scalp massage can damage the cuticle, the hard outer casing of the hair. This causes individual strands to become weak and break off, reducing overall hair volume. Certain drugs can contribute to excess hair growth, changes in hair color or texture and hair loss. Drug-induced hair loss, like any other type of hair loss, can have a real effect on your self-esteem. When applied, minoxidil is absorbed by the skin on the scalp and delivered directly to the hair follicles where you want your hair to grow back. 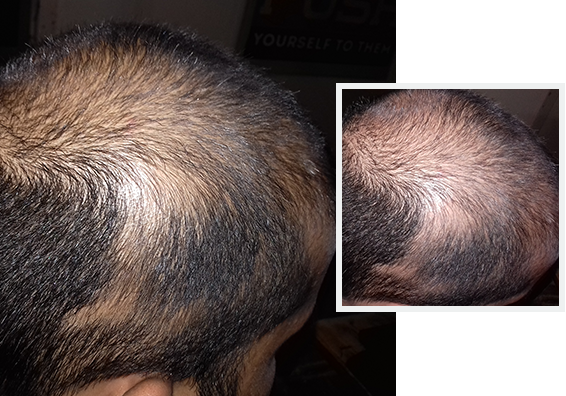 With continued use, the minoxidil is clinically proven to regrow hair on your bald spots and problem areas. 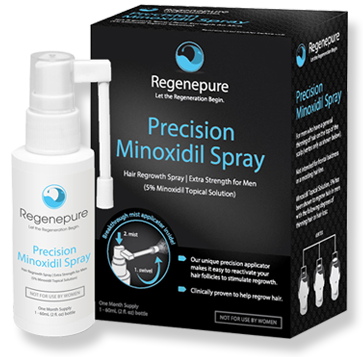 Regenepure Precision 5% Minoxidil Spray is specially designed for men. The fine mist applicator ensures a maximum and targeted delivery of minoxidil to thinning and hair-loss areas. The fine mist applicator ensures absolute accuracy, targeting problem areas with ease. The direct contact spray will also help provide the scalp with the oxygen and nutrients it needs to stimulate healthy hair regrowth. 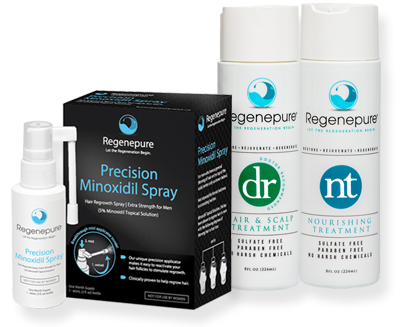 Regenepure Precision 5% Minoxidil Spray works best when used in conjunction with the Regenepure DR Hair Loss Shampoo, as the shampoo will help cleanse and detoxify hair follicles, allowing for optimal minoxidil absorption. Unlike foam or liquid applicators, the fine mist Regenepure minoxidil spray applicator ensures a clean and targeted application of minoxidil without any mess, spillage and cleanup. Minoxidil spray has proven to be a fan favorite because of its ease of use and virtually no-mess application. The swivel-head applicator of minoxidil spray delivers the minoxidil directly to your hair follicles with an even coat spread over your bald spots for maximum effectiveness. 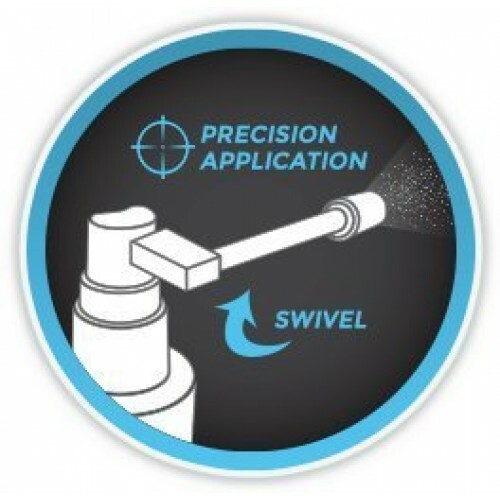 The revolutionary unique swivel spray applicator directly targets bald spots and delivers an even mist of the FDA-approved minoxidil, which is quickly absorbed into the hair follicles. Using foam is messy and ineffective, as theminoxidil does not reach folliclesand remains on hair strands. It also stains caps, hats, scarves and even bedding. Minoxidil liquid has even more disadvantages then the foam—mainly spillage, the potential of unwanted hair growth on the forehead and face and the liquid not being absorbed fully into the desired areas. 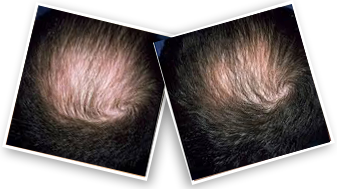 Minoxidil 5% FDA-approved treatment for male pattern hair loss in men is thought to induce an early anagen phase when it’s applied to your scalp, meaning it can cause hair follicles to go through the rest of the growth process prematurely before starting to grow again. Minoxidil takes 4-6 months before an individual should assess whether or not it helps. * Individual results may vary. This product is not intended to diagnose, treat, cure, or prevent any disease. 5% minoxidil boasts a 48% higher hair count than with 2% minoxidil. To maximize effectiveness, minoxidil must be directly applied onto the scalp, which makes a fine mist spray more effective than a foam or liquid solution.